Dalaman River has its source within Kocas Mountain located nearby Dirmil. It runs into the sea some 8 km south of Ortaca after its course through a narrow and deep valley where two of its branches, one coming from Göktepe and the other from Yaylacik Mountains, being part of the Western Taurus Mountains merge together. Its total length is : 229 km. It takes place between the rivers that attract the largest number of tourists as far as rafting is concerned. Dalaman River situated within Mugla province borders amongst Köycegiz and Dalaman is offering you R2 (difficulty rate : 3+) and R3 (difficulty rate : 3-4+) level course services. 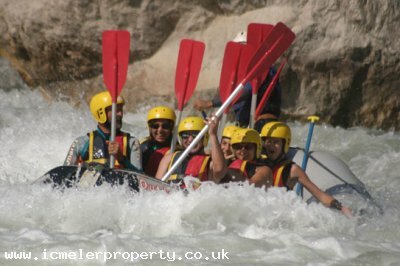 The river increases the adrenaline of the participants to the rafting activity through its rapid and exciting course track. Dalaman Upper River, which courses through a scenic gorge, is laced with Class I-III rapids that offer easy to moderate summer whitewater -- but still plenty of excitement -- for kids as young as 6. On a hot summer day, join the rafting team to cool down in the waters of fast mountain river near Dalaman. The rafting routes are specially designed for the different levels of rafting experience or none at all. You can be rafting by yourself or together with your friends in the larger boats.